What is the "Ride for Angels"? The "Ride for Angels" is a non-competitive charity cycling event to benefit Angel Flight NE. This one day event will consist of four different length rides to choose from (20 miles, 40 miles, 65 miles, and 100 miles ). After the ride, there will be a BBQ style lunch provided, vendor/sponsor tents to visit as well as a raffle with tremendous prizes. When and where is the "Ride for Angels" event? The Ninth Annual "Ride for Angels event is being held on Sunday, September 8, 2019. 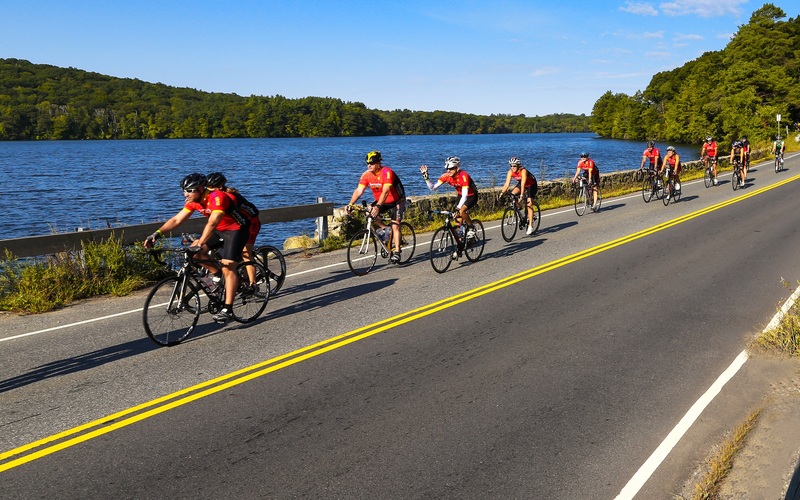 The start and finish of the rides as well as the other associated events will be held at Angel Flight NE corporate headquarters at the Lawrence Municipal Airport , 492 Sutton Street, North Andover, MA. How can I participate in the "Ride for Angels" event? There are several ways one may choose to participate in this wonderful event. Cycle: You can choose to ride one of the four designed routes. ($65 early registration fee, No fundraising requirement* see fundraising tab for more information). Donate Money: you can choose to donate money to an individual rider, a team of riders or to the general event fund. Please see the donate tab if you would like to donate now. Raise Money : You do not have to be a cyclist to raise money for the "Ride for Angels" event. Interested parties can raise money on behalf of this event and Angel Flight NE. Those individuals able to reach the fundraising benchmarks will be included in the same raffles as the cyclists. Volunteer : there are several different volunteer opportunities at the "Ride for Angels" event. How much does it cost to ride in the "Ride for Angels" event? The registration fee is $65 prior to July 1; $75 after July 1 and on the day of the event it will be $85. This fee includes a registration bag stuffed with goodies, a event t-shirt, a fully supported ride with snacks and drinks, a BBQ style lunch after the ride, on-site massage therapy services (tips recommended) and a whole lot of fun!! !